A fine example of Francisco Coello de Portugal y Quesada's massive map of Madrid, Spain. 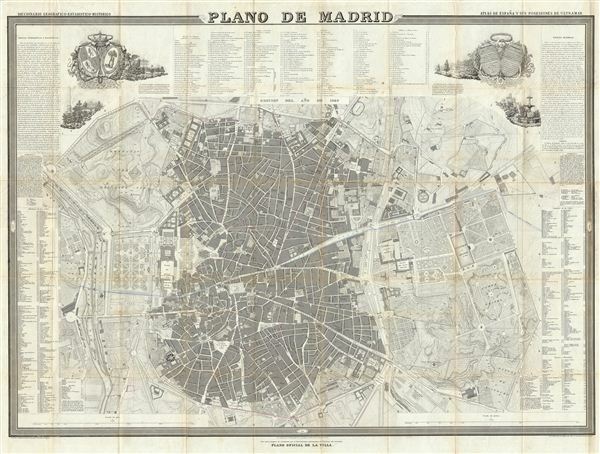 Coello's map is one of the finest and largest maps of Madrid to appear in the 19th century. Centered on the Puerta del Sol, this map covers the center of modern Madrid as well as the surrounding parks, farms, and estates - most of which have since been urbanized. Several decorative vignettes decorate the upper left and right quadrants. The map is advanced with detailed indexes identifying government offices, schools, libraries, museums, hospitals, convents, churches, theaters, streets, and plazas. Additional topographical and historical descriptive text appears in the upper left and right corners, respectively. Engraved by D. Juan Noguera in Madrid for Coello's unfinished opus Atlas de España y sus posesiones de Ultramar. Francisco Coello de Portugal y Quesada (1822 - September 30, 1898) was a Spanish cartographer, explorer, and military engineer active in the mid-19th century. Coello was born in Jaen, Spain and joined the military in 1833, enrolling at the Special Army Corps of Engineers Academy of Guadalajara. Upon graduating with honors he joined Corps of Military Engineers where after serving in the First Carlist War, and later in Algeria, he attained the rank of Colonel. Coello later founded the Geographical Society of Madrid and served many years as its president. He was also a corresponding member of the American Geographical Society and a full member of the Real Sociedad Geográfica de España. Coello's greatest work, his monumental Atlas de España y sus posesiones de Ultramar, was truncated by his death in 1898 and consequently never completed. Nevertheless, the work is of historical significance as the first scientifically produced maps of Spain, Cuba, and Porto Rico. Coello, F., Atlas de España y sus posesiones de Ultramar, (Madrid) 1849. Very good. Some discoloration and wear on original fold lines. Backed on archival tissue for stability.